This post is based on an article I helped write for SearchNurture titled How to Hit Your Target ACoS on Amazon. Amazon is, in effect, a giant search engine of products. To ensure that your book shows up first, you must target specific keywords both organically (i.e. based on your product description) and through Ads. However, no matter how successful your Ad is, all it can accomplish is lead shoppers to your product page. It is up to that to convince them to buy your book. Ideally, everything on your book page will be tailored for your target audience. Let’s take, for example, my book, A Heaven for Toasters. I want shoppers searching for “sci-fi crime romance” to buy my book. What can I do to make sure they do so? Start with your page title. Think of it as a hook. Let shoppers know they are on the right page by giving your book an appropriate title or subtitle. 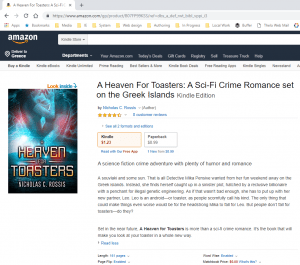 Even though my book is called A Heaven for Toasters, I added the subtitle, “A Sci-Fi Crime Romance set on the Greek Islands.” This will both help Amazon and shoppers know at a glance what my book is about. Images are quicker to scan than words, so most people’s eyes will fall on the book cover first. This must be crisp, professional, and enticing. Book covers can also establish your professional image and set the tone for both your book and the reading experience people can expect. It is a good idea to repeat your core keywords here. This will both encourage Amazon to display your product first on their Search Engine Results Page (SERP) and reassure people they have come to the right place. The perfect blurb will also correctly identify the need your book will fulfill. Are readers looking to be moved? Entertained? Informed? Make sure to portray your book as the perfect answer to this need and a sale is almost guaranteed. Also, mention any Unique Selling Points (USP). Why should shoppers prefer your book instead of a competitor’s? What is setting yours apart from the rest? This is particularly important with more expensive editions, as many people will naturally prefer the cheapest alternative if all else is (or seems to be) equal. For many shoppers, reviews are all-important. If your book has just been released and has no reviews, you may wish to factor this into your promotional strategy. For example, you could run a Giveaway to garner more reviews before you spend money on your Ads. If someone has left a bad review, you may wish to swiftly address any problems they mention, in order to encourage them to change it. One way to overcome a lack of reviews is through testimonials. If past customers have offered some kind words, mention them in the Editorial section. This is the best simulation of a word-of-mouth recommendation, especially if you make it clear that these testimonials are from real people (for example by adding their name and other pertinent details). Frequently-asked questions (FAQs) are another way to make it clear which need your book will fulfill, especially for non-fiction works. Use them not only to answer any questions people will have about your book but also to establish your brand’s superiority. Read more tips on writing the perfect blurb on my post, Dos and Don’ts on Writing a Book Blurb. My full post on hitting your Target ACoS is available on Search Nurture! Reblogged this on 🦉Pizzazz Book Promotions. This is excellent, Nicholas. And, this is an area in which I am completely inadequate, so your post is most helpful. Awesome article on how to set up your Amazon Book page. Must Share! Thanks for the great information!